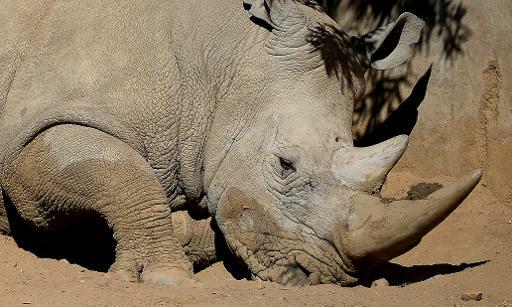 Johannesburg (AFP) – South Africa has lost nearly 1,000 rhinos this year in a poaching surge to feed the black-market demand for their horns, the environmental ministry said Thursday. “The total number of rhino poached in South Africa since January 2013 has increased to 946,” the ministry said in a statement. Asian demand for rhino horn — prized as a status symbol and wrongly thought to possess medicinal properties — has fuelled an ever more intense onslaught on the animals. In 2007 only 13 rhinoceros were reported hunted illegally in South Africa, but since then the numbers have increased exponentially every year. The toll stood at 668 in 2012, making 2013 the deadliest year on record for rhinos. A total of 330 arrests have been made so far this year. Sophisticated transnational criminal organisations dart the animals from helicopters, and then use hunters to hack off the horns while the rhinos are still alive. Up to now the criminals have stayed one step ahead of security forces, despite the deployment of soldiers in the renowned Kruger National Park, which has been hardest hit. “The park continues to bear the brunt of rhino poaching in South Africa with 573 rhino being killed for their horns since January 1, 2013,” said the environmental ministry. South Africa is home to around 80 percent of the world’s rhino population, estimated at more than 25,000. Their horns are of the same substance as human fingernails.